AURORA — In 2010, the city dropped its Holiday Magic Christmas celebration and the Phillips Park Fall Festival. In 2011, the Fourth of July parade is a potential casualty of the city’s budget woes. But the Roosevelt-Aurora American Legion Post 84 is making plans to pick up the parade, just as the city is planning to drop it. Earlier this month, Legion Post 84 members voted unanimously to act to save the parade. Alderman Stephanie Kifowit, 3rd Ward, who is also a member of the 300-member post, spearheaded the effort after informing the veterans group that the city had canceled the parade. “It is disrespectful to not have a parade celebrating our freedoms, our independence and the great country that we live in,” Kifowit said. According to the city’s 2011 budget proposal, Aurora officials reduced Fourth of July activity funds from $77,000 to $45,000. The parade was cut out, while the fireworks display is expected to continue. Kifowit said that as an alderman and veteran, she was “taken aback” by the city’ decision to eliminate funding for the Fourth of July parade. City Chief of Staff Carie Anne Ergo said that the cost wasn’t the largest issue in keeping the parade going — it was staff time. The city spent more than 330 hours of staff time on the parade last year, with about 100 hours involving the police and fire department staff. The parade itself cost about $30,000. With the elimination of the city Special Events Department because of Aurora’s projected $18 million deficit, Ergo said the city is looking for public-private partnerships to continue events. “Having the interest from veterans groups is exactly what the city was looking for,” Ergo said. Ergo said the city decided to continue to fund fireworks because of difference in attendance at the two events — between 3,000 and 5,000 citizens enjoy the parade each year, while more than 30,000 turn out for the fireworks. Legion Post 84 Commander Norris “Doc” Erickson said he was disappointed with the city’s decision. “It is a shame that the city of Aurora put significant time and energy into finding a partner for the Downtown Alive program but did not contact anyone with a plan to continue the Fourth of July parade,” Erickson said. Even if the city can’t find a private partner to make the parade happen, Ergo said the city has two other parades to honor veterans — Memorial Day and Veterans Day parades, which are not held in many other communities. Legion Post 84 intends to apply for the city’s festival and special event funding intended to provide funds to neighborhood and community groups. Applications for financial help are due on Feb. 21 at the Community Services Department. “If we are able to find a private partner that could move the parade forward, the city would look to provide some sort of financial assistance as long as a significant private investment is made,” Ergo said. The Legion is accepting donations to help fund the parade. Donations can be made to: Roosevelt-Aurora Post 84, P.O. Box 4784, Aurora, IL 60657. Despite the city’s budget woes, Aurora’s Fourth of July parade should step off again this summer, now that a local veterans group agreed to raise funds for half the cost. The city’s 2011 budget proposal would have cut funding for Fourth of July celebrations from $77,000 to $45,000, eliminating the parade but keeping the fireworks. But a partnership struck between the city and the Roosevelt-Aurora American Legion Post 84 could save the parade from the chopping black. The city has pledged to match money raised by the American Legion up to $15,000. Part of the matching city funds will come from the aldermanic funds of Aldermen-at-Large Bob O’Connor and Richard Irvin. According to the city, the Fourth of July Parade typically costs the city about $30,000 and 350 hours of staff time. “We had to make tough budget decisions and hope that civic and volunteer organizations would partner with us to preserve traditions like the Fourth of July parade,” Mayor Tom Weisner said in a press release. Alderman Stephanie Kifowit, 3rd Ward, a member of the post, spearheaded the effort to involve the veterans group. Members of the American Legion voted unanimously to help save the parade early this month. To get the parade up and marching, the city will be relying less on its own staff time. A liaison from the city will rely on veterans organizations and volunteers to organize and staff the event. Facing an $18 million deficit, the city has eliminated the Special Events Department and is relying on public-private partnerships to maintain special events. Aurora plans to continue its annual Memorial and Veterans Day parades this year. The Aurora Area Chamber of Commerce will be joining the American Legion in helping to raise funds for the parade. Donations can be made to Roosevelt-Aurora Post 84, P.O. Box 4784, Aurora, IL 60657. Editor’s note: The Beacon-News debuts “Troop Talk,” a new feature profiling local veterans, young and old. We’ll be spotlighting their experiences and memories with the military as well as their lives today. If you or someone you know would like to be profiled, please contact Katie Morell at katie.morell@gmail.com or call 630-978-8763. Back in the mid-1960s, 21-year-old Norris Erickson was happily working in Michigan for General Motors when he got a call. The bus took Erickson straight to Kentucky and Fort Knox, where he completed his boot camp training. From there, he was trained as a military policeman in Georgia at Fort Gordon. Just four months after leaving Michigan for boot camp, Erickson arrived in Panama and was soon “zapped by the humidity.” Pretty soon he was working in a police capacity around the area’s military bases. Down in Panama, things were peaceful and Erickson had the opportunity to explore some of the countryside. 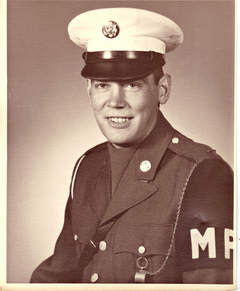 Erickson’s tour of duty ended in June 1967, and three years later he went to Palmer College of Chiropractic. He graduated in 1972 and came down to Sandwich to work for his aunt, who was also a chiropractor. “In the mid-’70s, I decided to go out on my own and have been doing it ever since,” he said. Today, he owns and operates Erickson Chiropractic Center at 715 Foran Lane in Aurora. Even though his formal military service ended in 1967, Erickson has made a lifelong commitment to staying involved with the service and is currently commander of Roosevelt-Aurora American Legion Post 84. About 20 years after he left the service, Erickson teamed up with VietNow, an organization designed to help Vietnam War veterans, to bring a half-size replica of the Vietnam Veterans Memorial Wall to Aurora. After a lot of orchestration, the wall arrived in Aurora for one week in May 1989. “We brought it here and put it on Illinois Avenue Island, which was then renamed Veterans Memorial Island,” he said, adding that the families of fallen Vietnam service members were contacted prior to the wall’s arrival. After the wall’s removal, a memorial was erected to honor past, present and future military. Erickson said he goes down to see the memorial every once in a while.